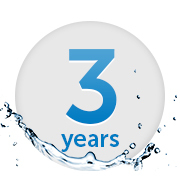 Aquabot revolutionized at-home pool cleaning by inventing the very first robotic pool cleaner over 30 years ago. With the new X4, they are delivering their most powerful and affordable robotic pool cleaner yet. Industry leading pumps and filtration systems circulate more water and catch more debris, for an overall cleaner and healthier pool. And with standard features like ultra-high efficiency operation, a brand new anti-tangle swivel and a 3-year warranty, the X4 is unlike any other robotic pool cleaner in its class. Industry leading motors that move up to 85 GPM and powerful filtration down to 2 microns means that your pool stays cleaner, clearer and requires fewer chemicals. The X4 does the dirty work while keeping you and your family safe, happy and healthy. The Extreme Series comes standard with an extra-long 60 foot floating cable and our brand new Aquabot Swivel, for worry-free automated cleaning. No more untangling lengths of cable halfway through a cleaning cycle. With plenty of length and tangle-free technology, you can reach and clean more of your pool than ever before. Typically, only 1% of pool contaminants are suspended in the water. 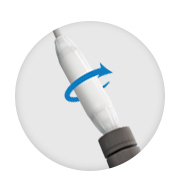 The rotating micro-brush agitates your pools surfaces to loosen up stubborn dirt, debris, algae and bacteria and scrub your pool clean, from floor to waterline and everywhere in between. 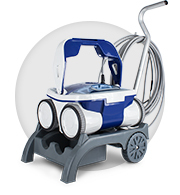 The Aquabot Extreme Series is the best value you can get in a pool cleaner. And that includes a 3 Year Warranty for hassle-free cleaning for years to come. 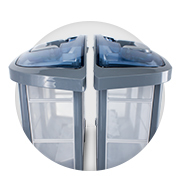 The pool robot caddy makes transporting the X4 to and from your pool easier than ever. 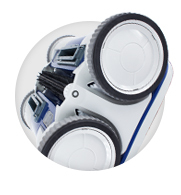 The convenient design allows for easy transportation of the robot, power supply and the floating power cable.